Fish, chocolate, pisco, tomato paste, palm hearts, whose packaging –boxes, cans, or bottles– is adorned, owing to the needs of advertising or image, with the name of pre-Columbian emperor. Even Inca Cola. 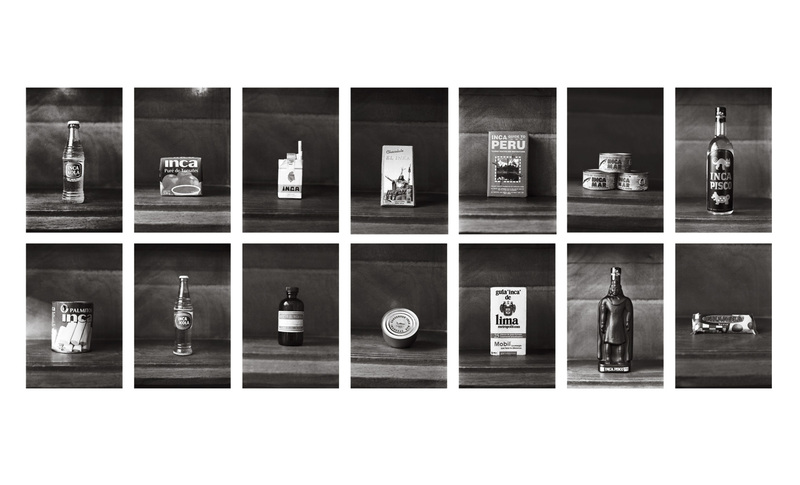 Extracts from shelves and cupboards, these objects seem to be the ready-mades of an interrupted identity. Born in 1969 in Lima, Peru. Lives in Lima, Peru. Susana Torres studied art history at the Universidad Nacional Mayor de San Marcos in Lima before training as a makeup artist and then starting to work as a self-taught visual artist. A founding member of the collective Sociedad Civil, she struggled against the authoritarian regime of Alberto Fujimori and collaborated on the production and art direction of two internationally acclaimed films by Claudia Llosa: Madeinusa (2005) and La teta asustada (2009). She teaches art direction at the Universidad Peruana de Ciencias Aplicadas (UPC). In addition to photography, she uses painting, ceramics, engraving, weaving, and performance to explore Peruvian identity and gender stereotypes, drawing on the imagery of articles of consumption and other mass culture objects. Her most recent solo exhibitions, all in Lima, have been: Peruvian Beauty: Centro de estéticas at the Sala Luis Miró Quesada Garland (2004), Campaña escolar. Honor al mérito at the Centro Cultural Peruano-Britanico (2007), and the retrospective El repase. Muestra antológica de Susana Torres, 1992-2007 at the Sala Raúl Porras Barrenechea. In 1997 she participated in the 6th Havana Biennial, and in 1997 and 2000 the 1st and 2nd Lima Biennials, as well as the first edition of the Trienal de Arte held in several towns in Chile in 2009.